The first impression on visiting is the new greenness in everything, especially the ride, the noise of birds singing loudly and the hum of bees. The first sign of new growth is to the left of the main gate before you enter the land. 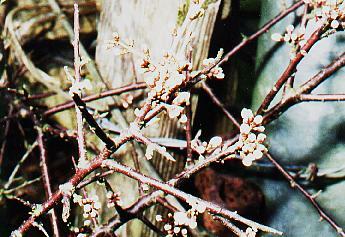 There you will see the Blackthorn flowers. 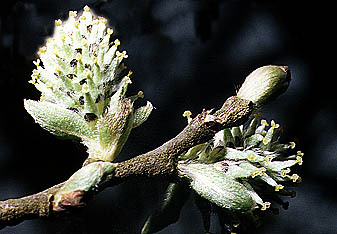 They appear before the leaves. In the first field the gorse is in flower and the fields are beginning to come alive. The combination of Spring's freshness and the winter skies can sometimes make for a quite dramatic scene. The willow blossoms are showing a splash of fresh colour against the rest of the trees. Here's a closer shot of the willow, By now, the hazel catkins are already turning brown and many have fallen onto the ground. The frogspawn has hatched but the tadpoles don't have their legs as yet. 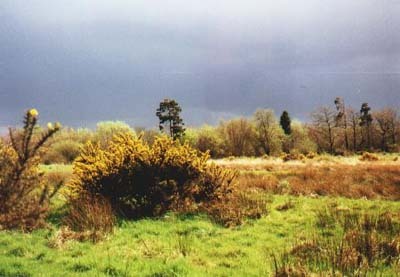 The Exmoor Cross ponies had arrived by April 2004 to start their work of keeping the long grass and scrub at bay. If you look carefully in amongst the reeds in the middle of the field you can spot the first growth of the Ragged Robin (Lychnis flos-calculi). 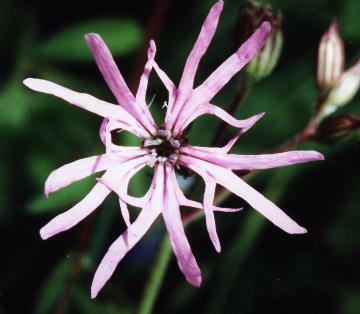 This will carry on flowering right throughout the summer and into the Autumn. But there is plenty of evidence of all sorts of plants appearing, such as Lady's Smock (Cardamine Pratensis), also known as Cuckooflower. 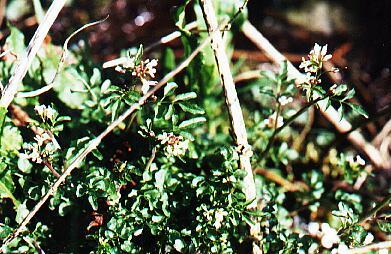 This plant is very important for the Orange Tip Butterfly. 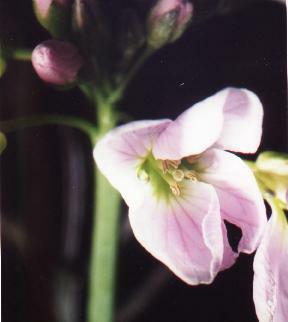 This is Broad leaved Bitter Cress (Cardamine Sp) - you can often find this plant at home, it's come into your garden in the bags of peat that you bought at the garden centre. 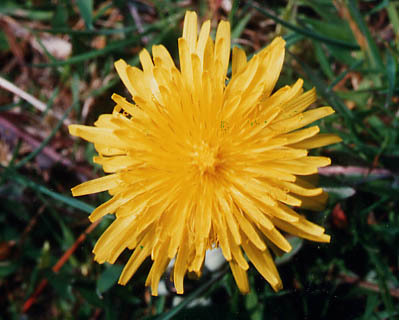 Even the humble Dandelion (Taraxacum Sp.) has started to appear. This seems to be thriving since the field has been grazed. 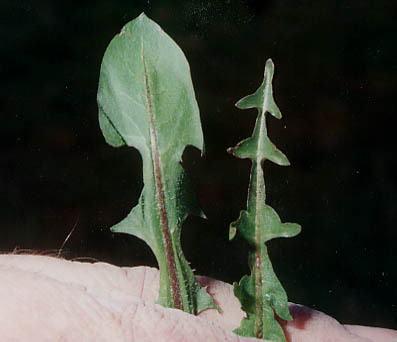 We think this one is the marsh Dandelion, it has much narrower leaves than the ones in our garden. Although, as you can see from the leaves, we appear to have two different sorts.